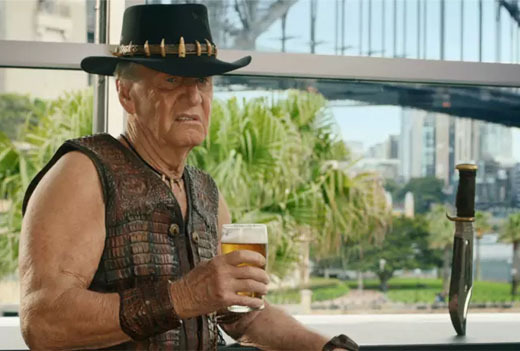 Following on from the extraordinary success of the ‘Dundee’ Australian Tourism Campaign, Transmission Films is pleased to announce that the real Crocodile Dundee himself, Paul Hogan, is indeed heading back to the big screen in a new feature film entitled, The Very Excellent Mr Dundee! And this time it’s for real! The Very Excellent Mr Dundee! sees Paul Hogan playing himself and on the brink of receiving a Knighthood for services to comedy. “Don’t do anything to mess this up”, his manager tells him. However, despite all his best efforts, the next six weeks sees his name and reputation hilariously destroyed. The Very Excellent Mr Dundee! is to be directed by Dean Murphy (Charlie & Boots, Strange Bedfellows) who is producing alongside Nigel Odell. Executive Producers are Kathy Morgan from LA based KMI who is handling international sales, Christopher Figg & Robert Whitehouse from London’s Piccadilly Pictures, Sherman Ng from Singapore’s Salt Media and Andrew Mackie & Richard Payten from Transmission Films. Fulcrum Media Finance and several equity partners complete the financing. The film will be set in Los Angeles and starts production in July with shooting taking place in Australia, Los Angeles and Vancouver. Whilst the producers are being tight lipped about the supporting cast, Hogan said ‘to watch this space as I’ve been honoured to have many of my friends and colleagues, whose work I adore, agree to join us for this hilarious new adventure’.